When using an iPad mini freezes can be a frustratingly regular occurrence. This can be caused by anything from having too many apps open. Opening an app that has malicious intent installed within. Whatever the reasons are for your iPad mini freezing, though, there will be an active and easy solution to dealing with the problem. It could be something as simple as the battery overheating or a more simplistic issue, such as Safari using up too much memory and causing phone to stop. Whatever the reasons, finding solutions to iPad Mini freezing is pretty simple. The first thing you want to take a look at is, as mentioned above, Safari. Safari can crash on you quite a lot, and it can be pretty frustrating when that does happen to you. As the main web browser for iPad users, though, it makes sense to get it sorted. If you are sick of shouting “My iPad Mini is frozen AGAIN!” then you can start by dealing with Safari. Simply go into “Settings > Safari > Clear History & Website Data” to clear your browser history and website data – this can help. Another option is to look at random third-party apps that might be causing the problem. This can be hard to decipher as everyone uses different apps, but it is worth looking into. 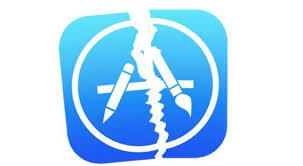 Close down all third party apps and open them up one-by-one until you find what the potential culprit is. Update the specific app to the latest version if there is a new update. Uninstall and reinstall the app if there is no update. Update all the apps which have new version if you are not sure which app causes iPad Mini freezes. Your last likely cause is freezing when updating. If this happens then you can reset the device and this will allow the update to start up again once you get back to the main screen. If this fails, connect to your PC and update your iPad Mini using iTunes instead. Seen as data usage and memory allocation determines how well your hardware can run, reducing your iPad wasted space is a pretty good way to start making consistent changes to your iPad to reduce the risk of facing more freezes in the future. Besides, regularly removing useless app data will also prevent your iPad Mini from freezing. iMyFone Umate Pro or iMyFone Umate Pro for Mac which is a complete solution for the above tips. This is a fantastic clean-up tool for iOS devices that can work with any iPad mini freezes, as well. Turning to this makes sense as it allows you to get an easy and effective solution without much hassle. To clean up useless data on your iPad Mini, here is what you can do on “iMyFone Umate Pro”. 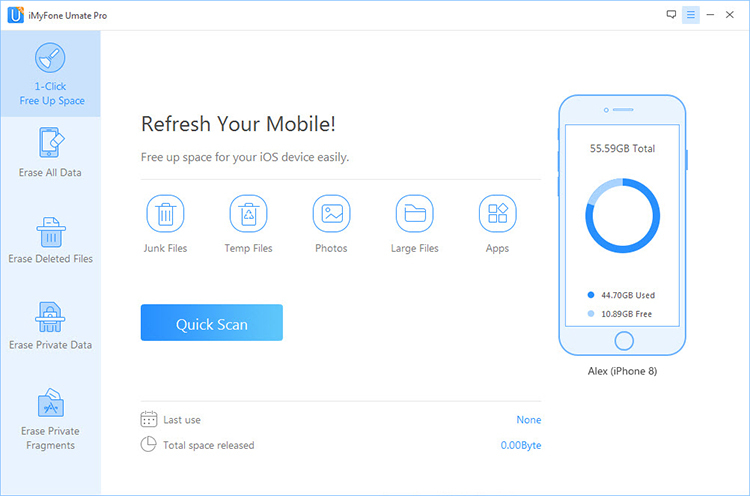 Clean Junk Files: It will help you to thoroughly remove all useless app data which would be dangerous to iPad Mini’s performance, like app cache, photo cache, user storage files, corrupted files, crash logs, temp downloaded files, etc. 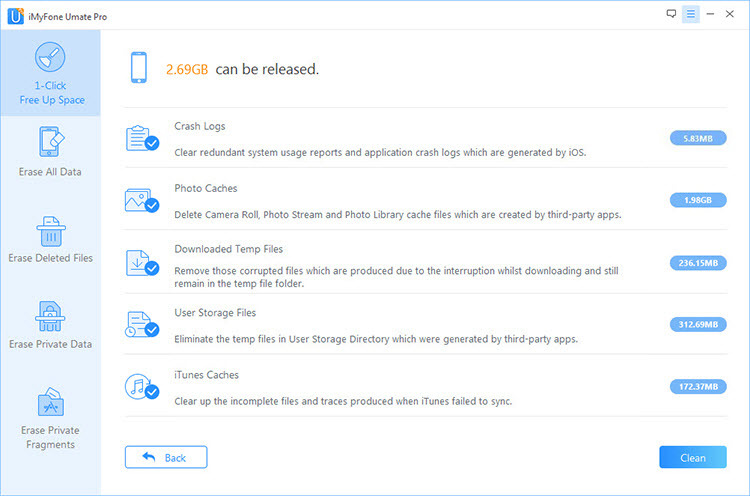 Erase Deleted Files: Do you notice that even you thoroughly remove some data from your iPhone, it is still possible to recover them? It is because some trace hidden in the deep are still there, which is not only unsafe but will also cause some issues, like frozen, crashing, restarting, etc. iMyFone Umate Pro can help you to find them out and you should choose to completely destroy them. It is simple to use. Here we take cleaning junk files for example. 1. Connect your iPad Mini to computer and launch the software. 2. Tap “Quick Scan” button at the home interface for a full analysis. 3. Tap “Clean” button of “Junk Files”. To use other functions, it is similar to clean junk files. Its instructions are clear and you can follow then one by one to make it. To release massive space for your iPad Mini, here are 2 modes you can use. 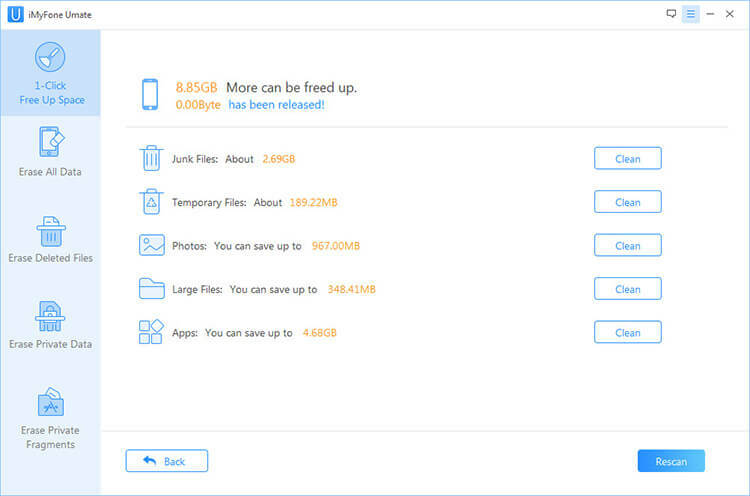 1-Click Free Up Space: Apart from “Junk Files”, you can also choose to clean temporary files, losslessly compress or massive delete photos, manage media according to different file types or sizes, and uninstall unused apps in bulk. You will have the option to back up data to computer first before deleting. Erase Private Data: Some unwanted or unnecessary files may be stored on your iPad Mini. It is time to remove them. 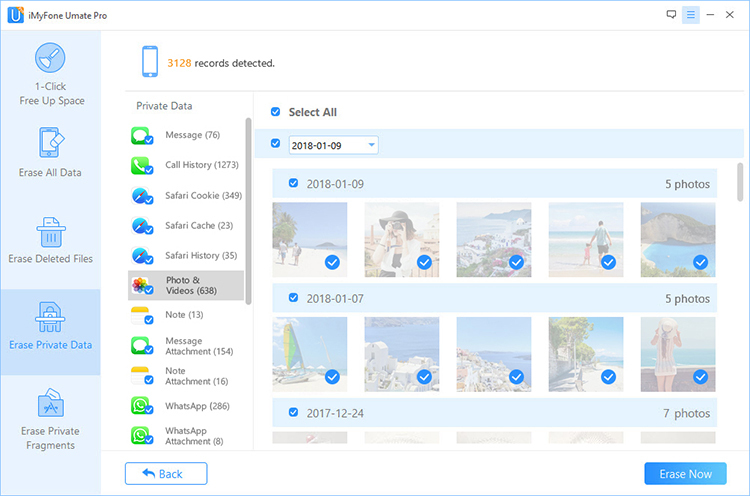 This offers you the safest way to remove your unwanted data, like messages, videos, call history, note, voice memo, etc. or >WhatsApp messages and media. It will permanently erase the selected data without leaving any trace in deep. So, how will you keep your iPad mini from freezing?